Well, technically, there are two, but one of them served 99.82 percent of the pair’s total time in office—to be explained later. If you’re from Northern New York and dislike the idea of people owning people, you’ll be pleased at his strong stance for freedom during one of our nation’s most turbulent times. 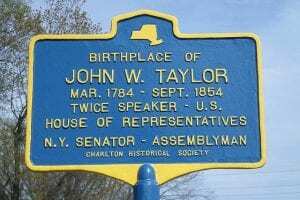 The man of the House is John W. Taylor, born in the town of Ballston Spa in 1784. (In 1791, when Saratoga County was created, his birthplace ended up in the town of Charlton.) Taylor enrolled at Union College in Schenectady at age 15, and graduated in 1803 as a 19-year-old valedictorian. He married Jane Hodge in 1806 (they would have eight children together), began studying law, and was admitted to the bar four years later. During the next several years, the Taylors lived at Hadley Landing (today’s Corinth), where he became a partner in a lumber business while serving as postmaster and town clerk. He was elected to the New York State Legislature in 1811, where strong debating skills won him leadership positions. Against banks seeking power through illegal means, and even against his own party’s recommendations, he stood unflinchingly against corruption, revealing a level of integrity much admired by voters. As a well-deserved result, he was reelected, but before completion of his second term, voters sent Taylor to the House of Representatives in Washington, where he began serving in spring 1813. His upbringing, education, religious ethics, and his father’s public service, helped mold Taylor into a capable, dedicated, and trusted public representative. For several years he acquitted himself well, was popular at Washington social events (including White House functions), and was respected enough by his colleagues to be appointed the second-ever House Whip (then an unofficial but important position). The question of slavery — specifically, the question of whether slavery should be allowed in territories and new states — thrust Taylor into the national spotlight in the years before 1820. Missouri was about to gain statehood, and John W. Taylor, along with fellow New York representatives James Tallmadge and Rufus King, led the fight to ban slavery there. Pro-slavery legislators were outraged when the Tallmadge Amendment was proposed, mandating, among other things, “that the further introduction of slavery or involuntary servitude be prohibited” in Missouri. After proposing the amendment, Tallmadge fell ill, leaving Taylor to fill the void. In doing so, he did not shy from debate. In a 1819 speech before the House, he criticized southern lawmakers who frequently voiced their dismay that slavery was entrenched and necessary to their existence. The amendment passed in the House but then failed in the Senate. The outcome was the Missouri Compromise: slavery was allowed in Missouri, but not in the other new state, Maine, and was banned in the future from north of the 36°30′ parallel. In October 1820, after guiding the Missouri Compromise towards passage, Henry Clay resigned as Speaker of the House. John Taylor, a House veteran of seven years, ran for the office on three issues, including opposition to extending slavery into territories and new states. His opponent from South Carolina, the popular and pro-slavery William Lowndes, came within one vote of winning during the 22 ballots that were cast, but in the end, Taylor eked out a narrow victory. Some historians cite the election and the Missouri Compromise as the first signs of deep and dangerous divisions in the young Union, with one section directly opposing another as if they were enemies. Supporters of the new Speaker weren’t entirely pleased once he took charge. Where party-member Taylor had been persistently active against slavery and served as House Whip, Speaker Taylor was criticized for pursuing his stated goal of total impartiality, not favoring one party’s agenda over the other. Perhaps he hoped to stem the poison of sectionalism and bring both sides together. Whatever the case, some Southerners distrusted his efforts, and some Northerners felt he had abandoned the fight against slavery. After replacing Clay, Taylor oversaw the period during which Missouri’s state constitution was reviewed. He served until March 1821, when his reelection bid was lost, due in part to Southerners voting against him for having resisted the spread of slavery. Two years later, Henry Clay returned to the position of Speaker, departing again in 1825. 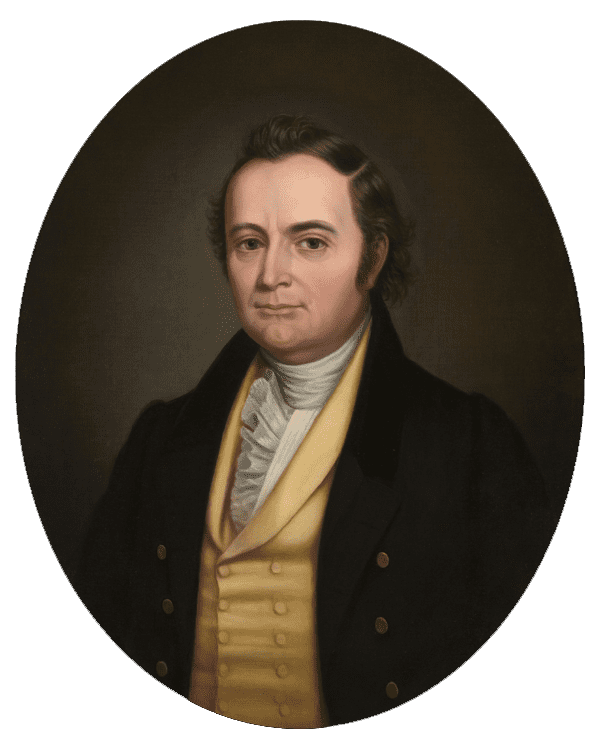 Taylor, who in the interim had supported John Quincy Adams’ winning of the presidency, ran again, and with the support of Adams, he was for a second time elected as Clay’s successor, winning by just two votes. He went on to serve as Speaker until March 1827, when another lost election (by 10 votes) was also attributed in large part to his opposition to slavery. During that same year, he was elected a vice-president of Union College. Taylor remained in the House of Representatives until 1833, a 20-year span that included service on important committees like Military Affairs, Foreign Relations, Ways and Means, and Elections. He returned to practicing law in Ballston Spa, and because of a deep dislike for President Andrew Jackson, joined New York’s Whig Party. 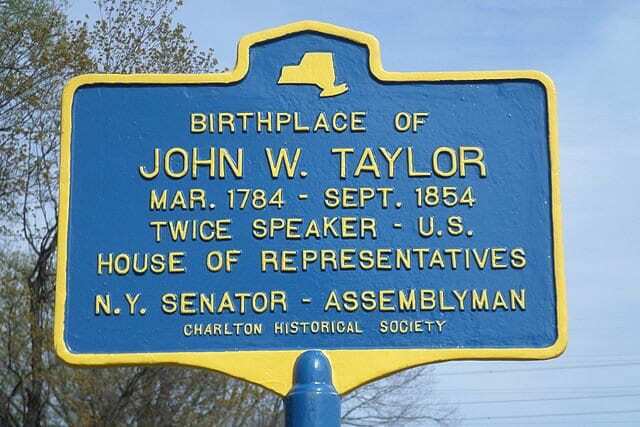 For several years he actively supported the party’s candidates, and in 1840, Taylor was a successful Whig candidate for the New York State Senate. The following year he suffered a stroke, and resigned in 1842. The next 11 years were spent with his daughter in Cleveland, where he died in September 1854. He was buried in Ballston Spa. As I mentioned earlier, John Taylor is almost the only New Yorker to serve as Speaker of the House. 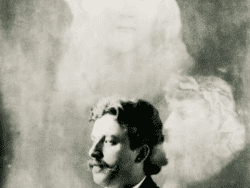 The other is Theodore M. Pomeroy. The Speaker at the time, Schuyler Colfax, had been elected vice-president on Ulysses S. Grant’s ticket. In order to be available for his swearing in at noon on March 4, 1869, Colfax resigned the speakership at 11 am the day before. Within about an hour, Theodore Pomeroy was sworn in. By law, the 40th Congress ended at noon the following day – as did Pomeroy’s term of approximately 24 hours.